Amazon's announcement that it might start to deliver products by an unmanned micro-copter-thing within the next five years led to almost complete derision from the internet, as the Twitter comedians imagined a future in which robocopters drop packages in gutters and on rooftops before veering out of control and swiftly and emotionlessly decapitating amazed onlookers. 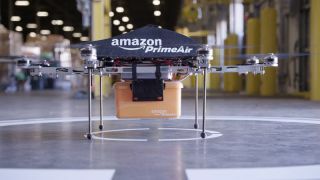 The facts, according to Amazon, are that its Amazon Prime Air service will get packages to customers in some areas within 30 minutes, while Amazon claims it's only waiting for regulatory approval before unleashing the drones in test locations. A move which, we have to admit, would be pretty awesome in a replacement hard drive emergency. But we can't imagine many local councillors agreeing to remote-bots flying down their leafy streets, and the mood of the online nation is equally aghast at the prospect of Amazon's possible mechanised future. Beneath Amazon's own YouTube reveal, user SeCs suggested it's just a pure lie designed to grab more Amazon Prime subscriptions today, saying: "Amazon used this stunt for publicity to drive people to their site. They want to appear as a tech company but the reality is that they are just a glorified middleman. Their drones will not work in inclement weather, they are prone to theft and destruction, accidents, they cannot deliver in cities, etc." At least he had an opinion. The vast majority of commenters came out with lies of their own, with the easy and most repeated joke of the week being people claiming they're going to shoot them down as soon as they see them, then steal the packages. Sure you are. Just like you shoot the postman dead every day and steal all of his parcels, right, hard man? Viewer Kelly Harlow had a proper question, though, asking: "Wait until a plane runs into one of these and crashes. How can they prevent that?" To which the answer was: "A commercial airliner flies at 30,000 feet." Poor Kelly. She didn't reply to this. Probably trying to work out how to delete her entire account in shame right now. Beneath a cynical Guardian take on Amazon's supposed innovation, user Bob_Helpful delivered a joke that at least veered away from the passive/aggressive threats to take them down with air rifles and stones, saying: "Wait, we get all these complaints from Greenwald and the left wing press about drone missions in Pakistan and Afghanistan and the whole time they were just trying to deliver series 4 of Breaking Bad to a guy in Kabul?" Reader DeadKennedy was impressed by Amazon's creativity and forward thinking, lamenting the fact that we're spending our time mocking this sort of thing. He said: "I love the negative comments on this thread. I love the cynicism and the people who are assured it won't work. It is easy to see why we do not stand a chance for crazy out-of-the box thinking in this country any more." Beneath a Wired discussion of the physics of the thing and whether or not current technology can back up Amazon's dream, reader Michael Johnson warned us against underestimating how quickly the required tech can evolve, saying: "Stable indoor toy helicopters have gone from impossible to every-kid-has-one in 10 years. I've been watching starting from when a retired helicopter engineer started posting YouTube videos of developing the first one, to when he partnered with a model company to make a plastic version through buying several along the way, each one less than half the price of the previous, to now when they are sold in mall kiosks and the 7-11." This generated a bizarre response by Bobbobitybob, who sees the future lying in "ornithopters" -- winged machines able to glide like birds. Bob's serious future fantasy world involves: "Large mechanical birds delivering packages," a move he says "...would please everyone, and there's no point in saying 'Do we really want our skies full of birds?' because of course they already are." Robot birds carrying cheap toasters to impatient internet shoppers with guns ready to shoot down rival deliveries sounds a little more threatening than the usual mild mannered chaffinches, though, Bob. Finally, Huffington Post reader FreeSpeech4All put a further downer on the plans for aerial stuff delivery, making everyone feel a bit sad and gluttonous as we approach the season of conspicuous consumption with the grim hypothesis: "We can develop drones to deliver cheap Chinese crap to people who don't need it, but we can't feed, clothe or house our citizens who need it the most." Harsh but true. we are removing a few items from our Amazon basket out of solidarity. Inflame is TechRadar's weekly look at beyond the fold - the best comments from technology's craziest stories.